For readers who do not know me, my name is Dan Yurman and I published a blog on nuclear energy titled “Idaho Samizdat” from 2007-2012. After a hiatus of just reading and watching the nuclear and space exploration industries, in August 2014 I started a new blog with a more general scope. I remain interested in both topics. Topics may stray into the fields of online publishing and the news media in general. This blog will be collection of news notes on things that I find interesting in these fields. My perspective is the “so what” question, the why, and ‘what does it mean’ of a news event. I do not have an agenda, point of view, and program other than a generally positive view of commercial nuclear energy and its benefits. I’ll try to be objective, but I do have opinions and will call them out as needed. All of the posts on this blog are solely my responsibility and are not intended to represent the views of any other person, employer, consulting client, organization, or business, etc. I do not have any financial interest in any project covered in this blog. This blog routinely posts items credited to NucNet and World Nuclear News. While I strive to credit them as sources where needed, they are not responsible for my commentary or additional reporting including with their edited text. This blog does not provide “advice” of any kind be it legal, financial, or engineering analysis. You are solely responsible for any use you make of information posted on this blog for the obvious reason that it makes no claim to having professional expertise in these areas. I’m on Twitter. You can follow me there via @djysrv The Twitter feed is very active and is updated several times a week. As of February 2019 it has over 2,000 followers. You can follow any of the listings on the Pro-nuclear Twitter feeds. Make your own list. This blog publishes a basic reading list on nuclear energy for generalists. A new web page added in September 2015, updated most recently in March 2019, is a directory of advanced nuclear reactor projects in North America. This blog post points to several U.S. and global databases listed these projects. In February 2019 the Energy Central site, which syndicates the content of this blog, awarded a post from Neutron Bytes as the “top post” of the year. See also a Profile interview at this link. Full text follows below. The content of this blog is protected by the copyright laws of the U.S. Please see this reference if you have questions about “Fair Use” of this material. The RSS feed is for your personal use only. You may not use it to populate another Internet site. Contact me for permission to republish my blog posts for academic or nonprofit use. Emails or texts sent to this blog about its content will be considered to be comments for publication unless otherwise noted. The default condition is that you are on the record unless you ask in the email to be anonymous or want to provide a comment privately without publication. Comments will be reviewed for civility and spam. I will allow anonymous comments except when they aren’t civil or are spam. Trolls and spam will be deleted without response to sender. This blog is syndicated at Nuclear Street and at Energy Central / Energy Collective. Syndication does not give third parties the rights to make further copies of blog posts. In February 2019 a syndicated blog post at the Energy Collective was recognized as the top post for 2018 at that site. I work on project management for new business development in the Cleveland / Akron region in northeast Ohio. I worked at the Idaho National Laboratory for 20 years from 1989-2009. Over half of that time involved in technology transfer work done with the lab’s scientists and engineers. I am a national member of the American Nuclear Society and serve on the Public Communications Committee and on the Social Media Team. 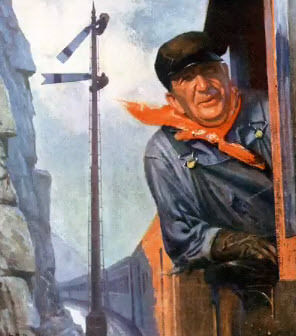 Why is there a picture of a railroad engineer at the top of this page? I was a rail fan at a young age and grew up in an era when steam locomotives were being phased out for more efficient diesels. The restoration of steam locomotives in the 21st Century is a fitting tribute to the men and women who worked on them when they were in revenue service. Readers are welcome to add brief notes and URLs about their favorites in the comments section. Here is a video clip of the 611 on a rail fan trip in 2017. This entry was posted in Author and tagged Nuclear. Bookmark the permalink. Dan, I learned about your site from Rod Adams. The galaxy photo is beautiful and perfect for your site. It conveys the atomic universe. My name is William (Bill) Gloege. I just started a group on the California Central Coast to support Diablo Canyon and nuclear power in general. We call ourselves “Citizens for Green Nuclear Power”. We have not got a web site yet but will. Our email address is citizensforgreennuclearpower@gmail.com. We are a small group of about eight regulars, but we have some technical talent with two Ph Ds and other advanced degrees. I have a Masters from Georgetown University. I studied international affairs and political science, but am drawn to nuclear because of the severe climate crisis. We have a drought in California that is only beginning to be felt. Many Californians as living off ground water and placating themselves with the fantasy that rains will return. However the drought is based on climate change – mainly changes in the Arctic. It is not going away in the opinion of serious scientists, like those at US Santa Cruz. In less than two years California will be on it’s knees as it drinks its last drops. We are 38 million people and a $2 trillion economy. The collapse will be spectacular. If this does not stifle the Deniers for good, nothing will. I look forward to reading your blog regularly. Please contact us if we can help you in any way. If you are out this way (Santa Maria, San Luis Obispo, Pismo Beach areas) let us know. We can call together a pow wow of like minded nuclear supporters. Maybe you’d like a Diablo tour? I remain a fan. This is excellent. We just published a major report on “National Nuclear Energy Strategies” driven first by urbanization in Asia (more than national security or climate change). We briefed DOE-NE two months ago. Look forward to hearing from you, Dan.